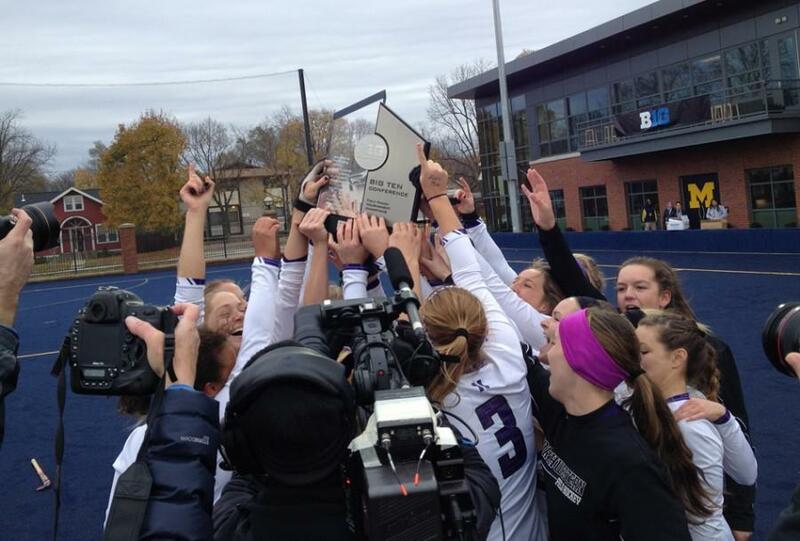 Northwestern players celebrate with their trophy after defeating Maryland to win the Big Ten Tournament. Sophomore Isabel Flens scored the go-ahead goal for Northwestern, and senior goalkeeper Maddy Carpenter was named tournament MVP. ANN ARBOR, Michigan — Northwestern toppled top-seed Maryland 3-1 in the Big Ten Tournament championship Sunday to claim its first ever Big Ten Tournament title. Senior goalkeeper Maddy Carpenter was named the tournament’s most valuable player. The Terrapins started out strong offensively, keeping the pressure on the Wildcats’ defense through the first 10 minutes of the contest. A shot on goal by senior Kelsey Thompson got the NU attack started, but the team could not keep it consistent until midway through the first half. The Cats put the pressure on starting at the 20-minute mark and never let up. With a green card issued to Maryland’s Maxine Fluharty, NU had a chance to convert while the Terrapins were undermanned. The Cats ended up not needing the card, as a minute after Maryland returned to full strength, junior Lisa McCarthy scored off a penalty corner with help from junior Charlotte Martin. The Terrapins responded almost immediately with a penalty corner goal of their own with 8:25 left in the first half. After swapping goals, NU had two consecutive penalty corner opportunities but could not capitalize on either, with Maryland knocking them away and marching down the field after the second. The NU defense held into halftime with the score tied 1-1. In the second half, the Terrapins applied pressure early but, like the Cats in the beginning of the game, could not maintain it consistently, missing two shots wide left of the goal. NU started out with plenty of pressure, keeping the ball within Maryland territory for many of the opening minutes. Two consecutive corners proved unfruitful, but a third consecutive corner put the Cats on top with sophomore Isabel Flens netting the ball. After reviewing an official ruling, Maryland lined up for a penalty corner with 21:19 remaining in regulation but could not convert. The Terrapins earned a second penalty corner 54 seconds later, but could not score on the second try. The NU defense stifled Maryland and held off numerous attacks throughout the game. With defensive support, the Cats offense turned up the heat and forced the Terrapins to play more defense, outshooting Maryland at one point 14 to 5. The numerous shots paid off for NU with a goal by the Cats’ scoring leader, Masters, to put away the game, 3-1. To get to this point, NU had to beat storied conference foe, Michigan. Earlier in the season, the Cats fell to the Wolverines 2-1, but came away with a 2-1, overtime win on Friday. The final goal had to be reviewed by the officials before NU could finally celebrate making it to the Big Ten Title game for the first time under coach Tracey Fuchs. After the championship, NU could finally take a short moment to celebrate their accomplishments before thinking about their 2014 NCAA Tournament bid. Carpenter’s eyes began to well up with pride for her team. Fuchs vocalized the same sentiments towards her Cats teams.